As we enjoy the hustle and bustle of this holiday season, most of us will take a few minutes to reflect on “all the things great” surrounding us. We’ll get to enjoy holiday parties and spend time with family, friends and co-workers. What is most enjoyable and satisfying is our gift of giving! Seeing a family member get excited about a special gift you present them is so rewarding and valuable. Here’s a gift for you to share, a gift that counts—Forecast Value Added. This year, give your co-workers and planning organization a new metric known as FVA to drive value through all of 2018 and for years to come. 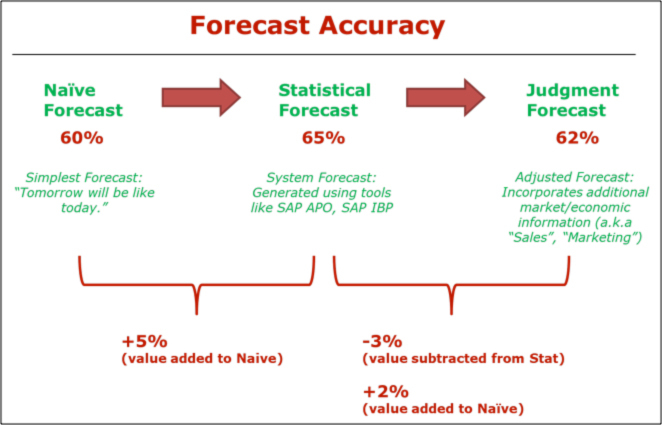 So what is Forecast Value Added? How can it be useful to me and a valuable gift to my colleagues? FVA is a metric that allows you to evaluate the performance of each step, each level, and even each participant/planner in the forecasting process. It expresses the results of doing something versus doing nothing. FVA can be either positive or negative, indicating whether your efforts are adding value to the forecast, or making it worse, and to what degree. Measuring FVA allows you to identify waste and inefficiency in the forecasting process. Consider this: Most people will pay a bill that they know they owe. Most people will follow rules and laws if they know what those rules and laws are. Most people will do the right thing most of the time. In our business and planning environments, most employees want to, and will, add value when they know what that value is. Or in contrary, most will stop hampering the process if they know what is causing it. If you are a manager of a planning organization, consider giving the gift of FVA targets in exchange for Forecast Accuracy targets next year. Planners actually have more control of the value they provide to the forecasting process. They want to add value and it is rewarding to them when they do. Although Forecast Accuracy is one of the most common and traditional metrics for measuring forecasting success, planners don’t have control over many of the aspects of the result. Demand planners don’t control inventory planning or product availability. Demand planners aren’t responsible for customer orders or shipments either. But they can control the accuracy of the statistical forecast, and they can determine which forecast inputs are adding or obstructing value. And they can drive communication and forecast adjustments to minimize the harm. So, this holiday season consider giving a gift that counts to your colleagues and business. Share the concept of Forecast Value Added and begin using it to drive value in your planning process. For more information about Forecast Value Added, watch our webinar called FVA: The New Frontier.